ECOS "Treeless" Toilet Paper (72 Roll Case) by Earth Friendly Products is of the most ecologically sound Bathroom Tissues ever made! Using renewable bamboo and sugarcane, ECOS™ Treeless Paper products are the soft and strong alternatives to recycled paper. Readily biodegradable, ECOS™ Treeless Toilet Paper is free of inks, dyes and fragrances. 300 x 2-ply sheets per roll. Earth Friendly Products New "Treeless" Toilet Paper Rolls are safe for you and reduce stress on our forests & the environment. ECOS Toilet Paper has the look, feel and softness of regular Toilet Paper, but with the benefits of being a sustainably produced using readily renwable ingredients from super fast growing Sugarcane and Bamboo! Each Case contains 6 x 12 Roll Packs for a total of 72 Earth Friendly Toilet Paper Rolls. Each Roll is 300 2 ply sheets! That's almost double the previous ECOS TP Roll sizes! 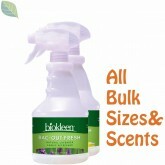 Earth Friendly Bathroom Tissue is Free of Perfumes & Dyes. 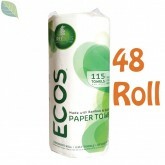 ECOS Treeless Toilet Paper is made from 100% Renewable & Biodegradable resources. 100% recycled content: 80% Post Consumer & 20% Pre Consumer Content. Highest post-consumer waste content possible! The source of raw materials originate in the Sichuan Province of Western China. The producer harvests from its fully owned 8,240 acres of bamboo forests. The sugarcane raw material is sourced in Thailand where we source sugarcane bagasse pulp. “Bagasse” is the fibrous matter that remains after sugarcane stalks are crushed to extract their juice.